I'm always eager to try new barbecue rubs. As a competitor I am especially interested in trying products that are winning big time out on the competition circuit. However, this particular rub had me so intrigued that I ordered some shortly after it became available. Why was I so anxious to try the Slap Yo' Daddy Chicken Rub? 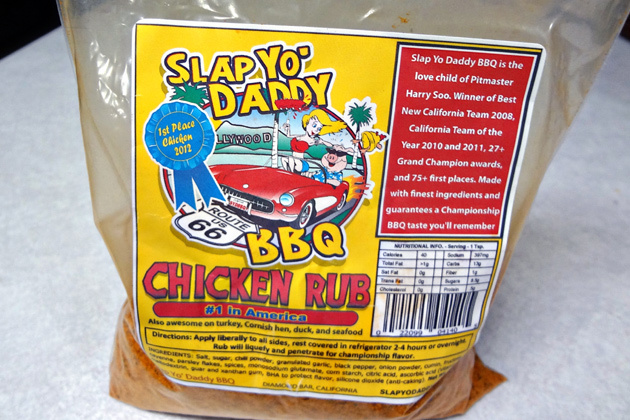 Well, I've been a fan of Slap Yo' Daddy pitmaster Harry Soo since I saw him on the first season of the BBQ Pitmasters series in late 2009. He had many of the traits that I admire in any cook; he was humble, friendly, tenacious, highly-skilled, and you could immediately tell that he's a man who passionately enjoys his craft. He's also very open about his techniques and is willing to teach people. 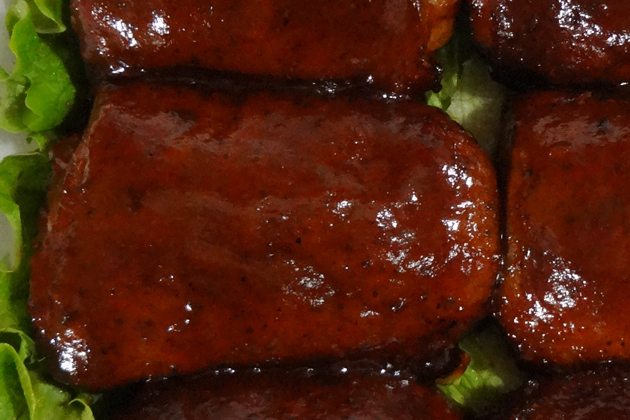 He strives to spread what he calls "barbecue happiness". Then in 2010 I got to meet and compete against Harry here in Boise where he beat me (and most of the rest of the field) like a rented mule. He was on a serious tear that year, as he's been for his entire competitive barbecue career. I distinctly remember him going around to each team and offering to teach people how to build a turn-in box. It's exceedingly rare for a competitor to offer that kind of help to people who are there to beat you, but that's Harry. Since then he's gone on to be named 2012 KCBS Chicken Team of The Year. Last November Harry and I met again at the Kingsford Invitational where he was a judge. During our time there they held a panel discussion where the judges discussed various aspects of barbecue and competition. It was during that panel that Harry said something that sparked some serious curiosity. He said that the secret to the color of his competition chicken is Tang. Yes, Tang, that NASA-born powdered orange drink mix. It struck me as so odd that I thought that I had misunderstood what he said. "Surely he didn't say Tang! ", I thought to myself. After the panel I found Harry and asked him about his unusual ingredient. He explained that he approaches his competition barbecue like a series of Lego-like components where each piece has to fit to make a perfect whole. His Tang epiphany came to him as he was working on the color block. It's this kind of unconventional thinking that shows what a masterful technician Harry is. So, when Harry introduced his new rub I knew that I had to try it immediately. I wrote him an e-mail and asked if I still needed to use the coat of Tang under the rub and he replied, "It's designed to be used as the only rub so you don't need to add anything else or other products. 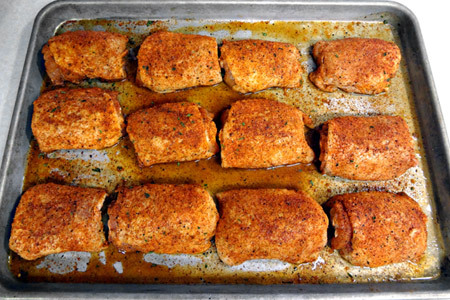 It's championship chicken in one easy-to-use rub package." Ascorbic acid and artificial color are listed as ingredients, so clearly he has incorporated his secret ingredient. To give the rub a true test I used it for a competition test cook using the instructions on the bag. I trimmed the chicken thighs, coated them liberally on all sides with the rub, then let them marinate several hours. Just before cooking I touched up the rub to ensure that I had a nice uniform coat with no bald spots. Next I arranged them on the (oiled) rack for my Pit Barrel Cooker. 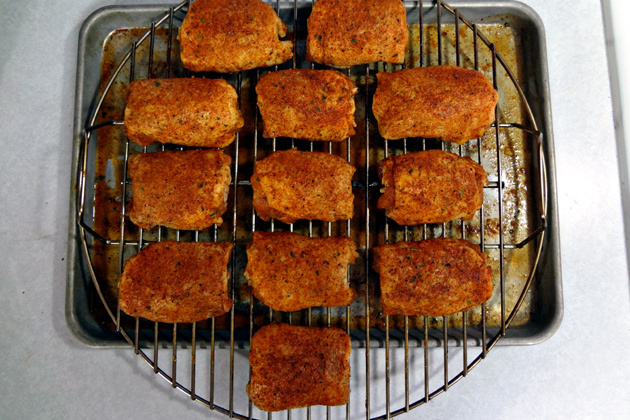 I cooked them over plain Kingsford® Original briquets (no smoke wood) to an internal temperature of 170º. For sauce Harry recommends, "KC Masterpiece® with honey, hot sauce to your liking, and diluted with apple juice so that the sauce goes on thinly and not goopy." For mine I thinned Sweet Baby Ray's Original with unsweetened pineapple juice and added some honey and Franks® RedHot®. Using tongs I gently dunked each thigh in warmed sauce twice, letting them cook about 10 minutes between coats. Dunking ensures a perfectly uniform coating with no brush marks. It also helps avoid brushing the rub off of the skin. I garnished a standard turn-in box, added the chicken, then closed the box for 10-15 minutes. Here's a closer view. Check out that color! They were moist, juicy, slightly smoky, with just the right balance of salt, sweet, tang, and spice. The skin was bite-through. The thing that really impressed me is the great first-bite burst of flavor. That's exactly what you want for competition chicken because the judges typically take only one or two bites of each entry. You need a rub that really makes them take notice, and Harry's certainly does. As you can no doubt tell by now that I recommend this rub very highly. It's not just for competition, so get some and take it for a spin. Disclaimer: I purchased the rub at full retail price, and I was not compensated in any way for this review. Thanks for the review John. Very nice writeup. FYI, for competition, I actually put more rub than you did. Thanks, Harry. More than that?! How do you get it to stick? Mine were completely coated and the extra was just rolling off. Excellent write up, John! That was one cook that I am planning on trying. The whole "Tang" thing caught my attention in November too. What temp did you cook the chicken to and for how long? lol. My rub won't fall off if you let it sit first for 30 mins to get tacky on one side; then flip over and apply the other side. Put in fridge overnight. My dry brine process works very well which I found out after countless experiments. OK, that makes sense. I coated each piece completely, refrigerated for several hours. Then I coated them again on both sides just before they hit the cooker. 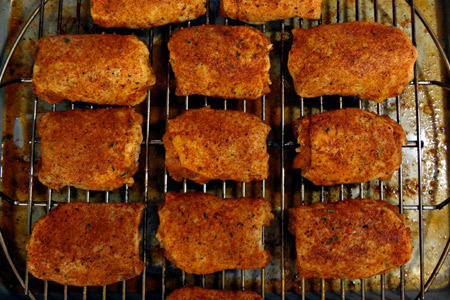 @Harry Soo - Thanks for sharing your secret to a thick rub coating. While I do not have access to YOUR rub, I intend to apply your technique to applying my latest dry rub recipe to tonight's smoked chicken thigh meal. Did you scrape the skins to get them bite through? I did a test with Harry's rub (based on your and his advice), half skin on, half were skinless, and the exterior turned out tough. The rest was great. Really liked the review and great tips from you and Harry! Richard - No, I don't scrape my skin. Have to say I am very pleased with Harry's Chicken Rub. I managed a 13th place out of 182 teams this 09/27/2014 at the Pasadena Cook Off in Texas. I did do a salt/sugar water brine and glazed with a chipotle raspberry sauce. We have to turn in 1/2 a whole chicken plus pieces so that is why I did a brine. 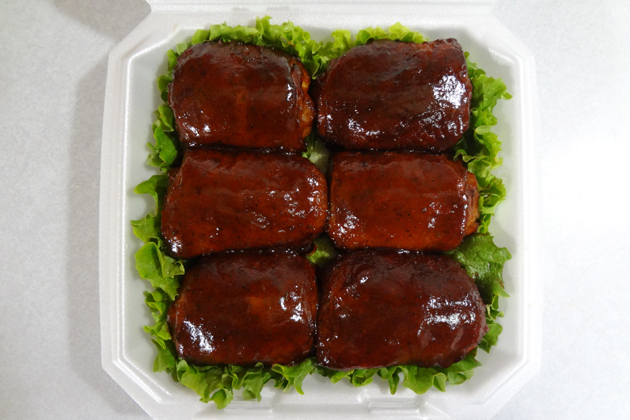 Just ordered some more of Harry's Chicken Rub..3rd Place in Eastern NC BBQ Throwdown last Oct Great Stuff!